Many companies applying lean use a top-down approach - a person or small group defines the business process in general terms and progressively expands it into more detailed elements. This method fails when the person or small group defining the process lacks the detailed knowledge of the tasks involved to sequence them correctly. Creating Lean Corporations, by Jeffrey Morgan, however, utilizes a bottom-up approach in which the employees who perform the tasks are empowered to create and manage their own portions of the business process. Each task is defined using a task model that indicates the input-output relationships between tasks -- it dictates the sequence that the tasks should be performed within the business process. This approach is essential for creating and improving business processes that are large and complex but still efficient. (1) Hierarchies for managing large, complex systems and processes -- A template for all lean organizations is presented that allows functional (horizontal) and process-oriented (vertical) groups to be integrated into a single organizational hierarchy where command-and-control is clear and direct. (2) The use of process models to define the organization's business processes -- A standard method of process modeling that allows business processes to be represented and managed as hierarchies. The benefit of this approach is that process management is implemented in a hierarchical fashion where the level of detail increases as you move down the levels in the hierarchy. (3) A lean, bottom-up approach to business process reengineering - this works much better than traditional top-down approaches on larger, more complex business processes. This lean approach was successfully applied at a major automotive manufacturing company and was awarded the Charles F. "Boss" Kettering Award as one of the most important technological innovations in 2000. This book is for business process managers (especially lean leaders) who seek to reengineer their business processes using lean principles. "By reducing redundant efforts and keeping tasks on schedule, [Morgan's] system has resulted in a 25 to 30 percent improvement in Powertrain's analysis productivity." 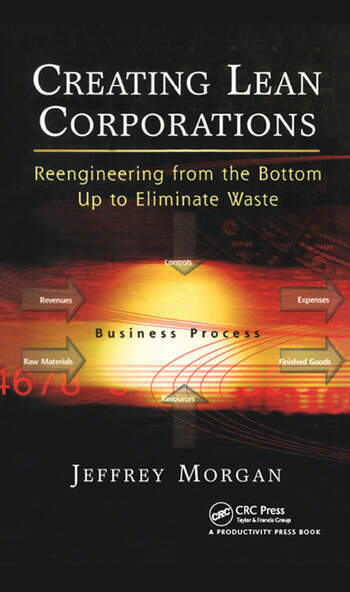 "Jeffrey Morgan's excellent book, Creating Lean Corporations -- Reengineering from the Bottom Up to Eliminate Waste, stresses the all-important but too-often-overlooked systems perspective of business processes as sets of interrelated activities." "This book is a fresh, nontraditional approach to using lean, borrowing techniques from other fields. I would recommend it to any organization starting to implement lean or one that needs to rejuvenate its current lean system."